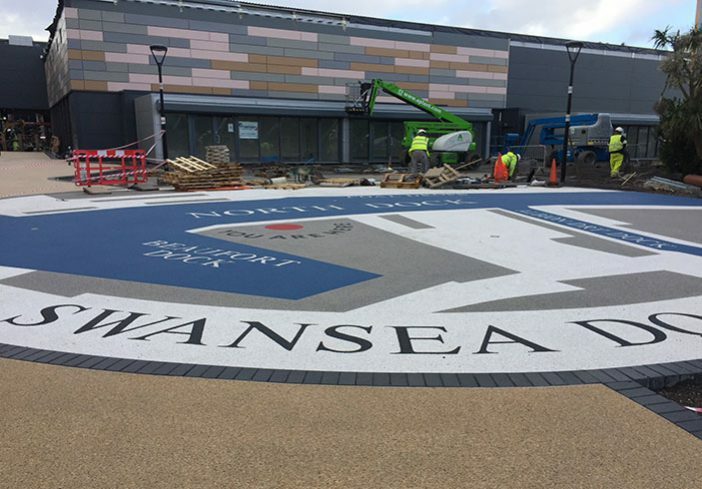 Clearstone installs prominent resin bound wayfinding graphic for the Parc Tawe retail park redevelopment, paying homage to Swansea’s dockyard heritage. The area occupied by Parc Tawe was once Swansea’s North Dock, opened in 1852 and at one time exporting 60% of the world’s copper from factories situated in the Tawe valley. 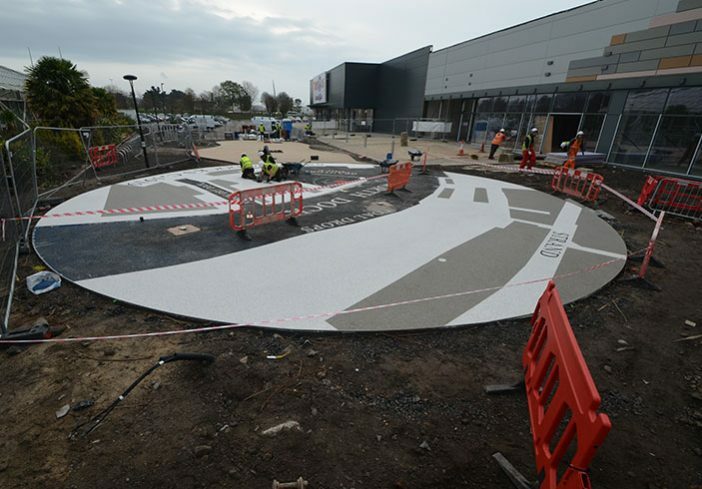 Owner managers Hammerson plc took bold steps to update and transform the retail park, with a £15 million refurbishment to update Parc Tawe into a high-quality leisure and retail park destination. Architects RGP were commissioned to draw up plans, and recognised that a new, inspiring entrance should be created for the park. 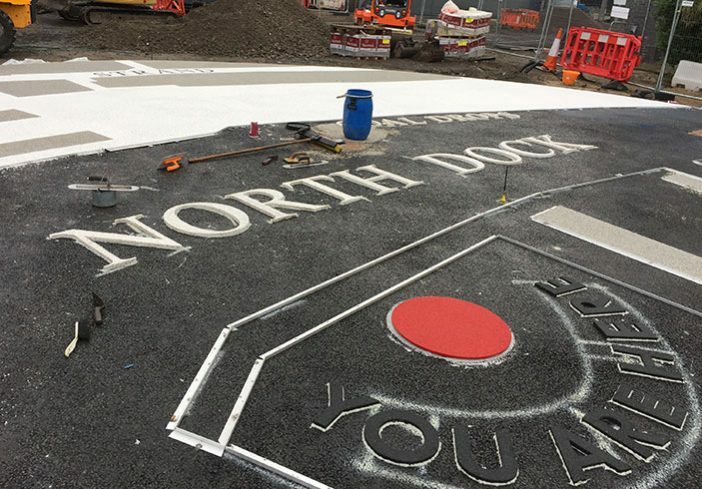 Keeping the area’s industrial heritage in mind, RGP designed a public realm artwork in the form of a wayfinding graphic, to draw visitors through the complex while adding historical context. 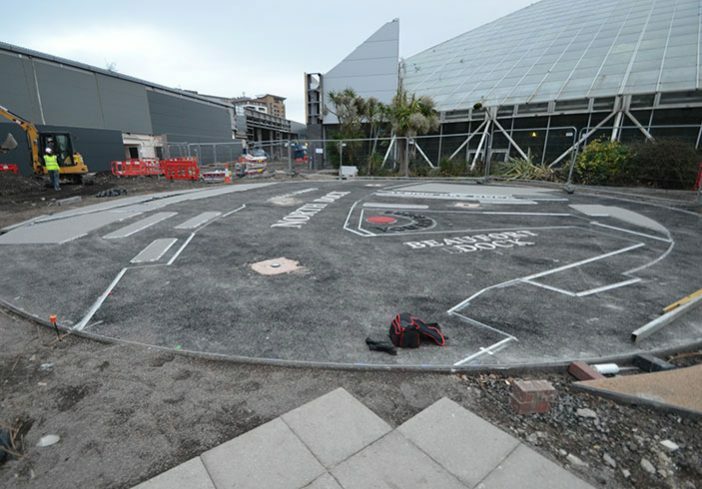 The approach to Parc Tawe, and its connection to Swansea’s city centre, were recognised as being in need of improvement. A previously enclosed corridor masked the side elevation to the Odeon cinema. This was opened up, creating restaurant courtyards and facilitating a pavement coffee culture linking towards the cinema foyer. 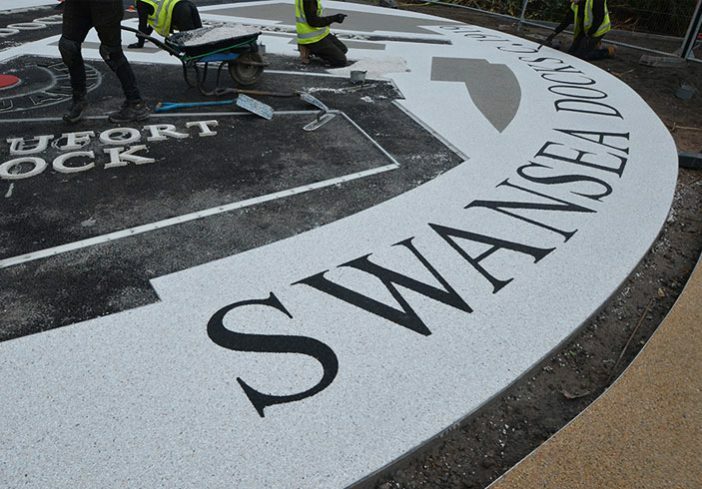 Hard and soft landscaping has played a vital role in creating this refreshed feel to Parc Tawe. Clearstone interpreted the architect’s drawings supplied by ISG plc, contractors on site undertaking the refurbishment for Hammerson. Clearstone realised RGP architect’s vision, precisely creating a bold 809 m2 concourse graphic – a stunning focal point outside the Odeon cinema. 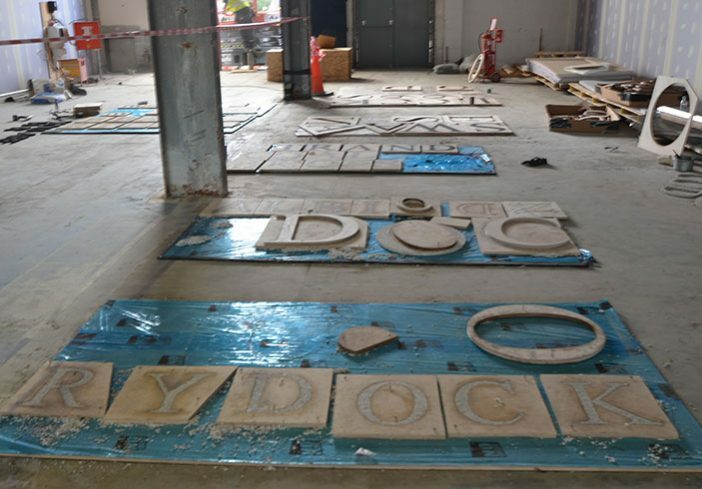 Andy Forsey, Clearstone’s design lead, used Vectorworks to overlay the architect’s drawing, enabling individual elements to be laser cut, and calculated the quantities of materials needed for the installation. 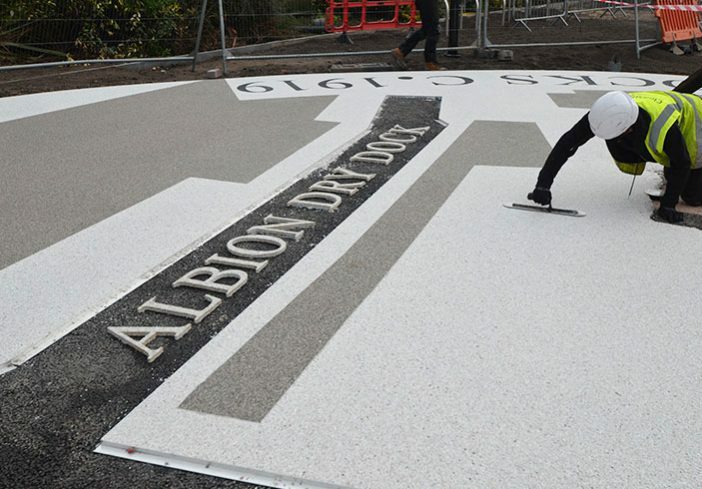 Then Clearstone’s team of highly trained craftsmen took the laser-stencil-cut letters and carefully pinned them in place, before infilling the design with PrismStone®, Clearstone’s colour coated quartz range, designed for decorative surfaces. This careful process enabled the graphic to take shape exactly as envisioned by the scheme’s architects. 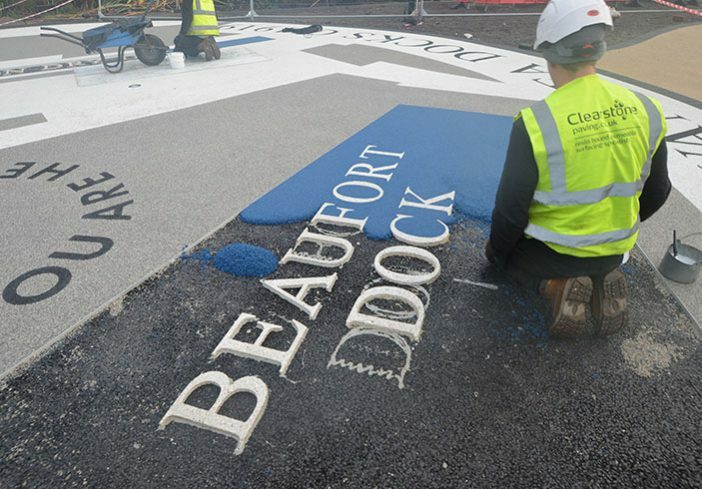 “Our ISG site team were happy with the service received by Clearstone. Spencer, Clearstone’s operations director, was a joy to deal with throughout, despite our complex and chaotic programme which proved testing” said Richard Day. 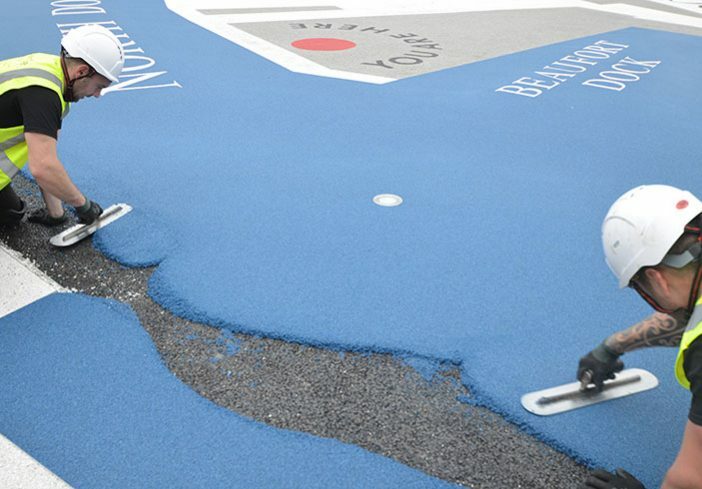 The bright and colourful wayfinding pavement graphic creates a point of interest for the public. 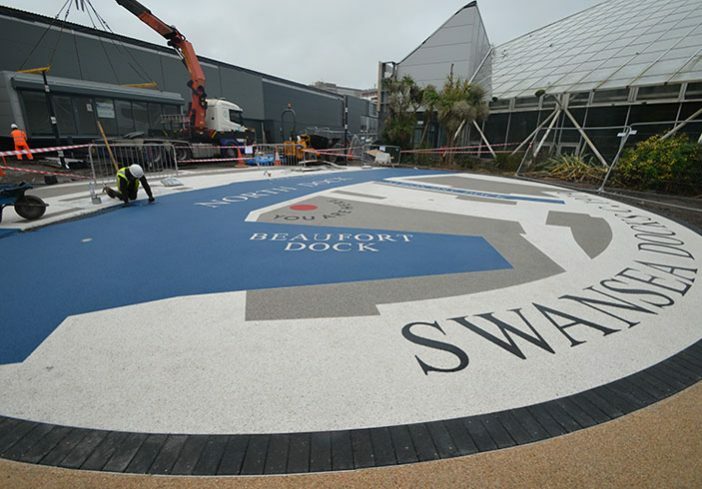 It helps visitors locate and orientate themselves within the landscape, while reminding them of Swansea’s important seafaring heritage and industrial past. 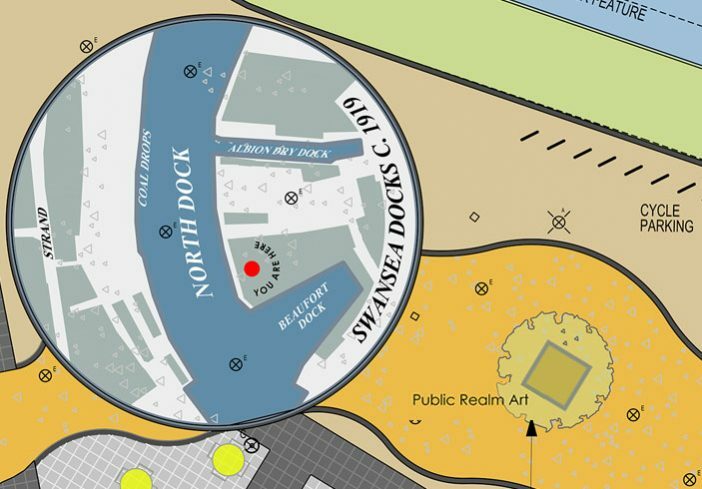 The new graphic provides an immersive talking point and an opportunity for the people of Swansea to reconnect with the maritime history of their town. 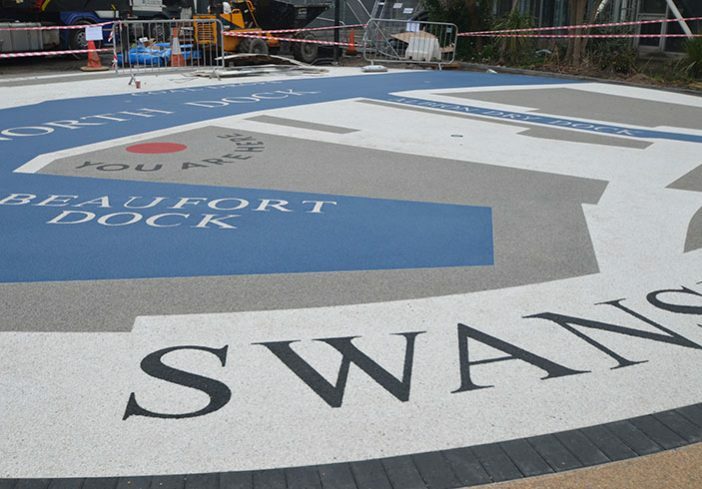 The effect is dramatic, combining with other aspects of the refurbishment to convey the strong message that Parc Tawe has been truly transformed. 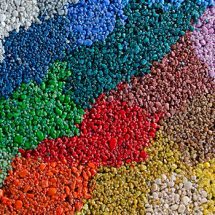 Available in 1,500 RAL colours for creative decorative landscaping projects.